Connor Barwin drops by today's Buzz podcast. Did you know that football players put Vaseline on their arms and wear surgical gloves under their football gloves when they played in the snow? This was one of the nuggets Eagles linebacker Connor Barwin shared on a new edition of "The Buzz" podcast. Barwin also gave his opinion on the Eagles’ turnaround, what it’s like to play for Chip Kelly, whether the NFL should add more games and the Thursday night game. "Your body doesn’t recover fast enough," he said. "I feel like you put yourself at a lot bigger risk for injury when you play on Thursday then if you go Sunday to Sunday." Barwin, an enormous music fan, gave us his top albums of 2013 and shared his thoughts on Bruno Mars performing at this year’s Super Bowl. 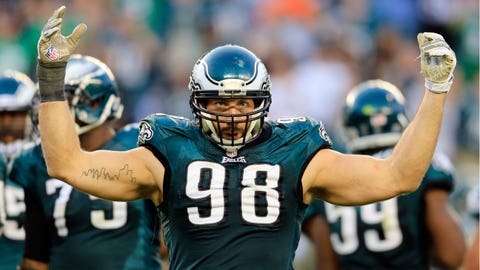 "I got no problem with that," Barwin said. "I think he’s an entertaining little guy, man. He’ll be bouncing around. I’m sure he’ll do a great job." We also discussed whether or not Barwin is indeed an NFL hipster and argued about whether celebrations should be allowed in the league. You can download the podcast on iTunes or listen to it below.